If you're looking to get rid of your constipation, your diet is your starting point. A dip of creamy ice cream tastes good, but it might be a bad idea if you are constipated. Constipation can have a number of underlying causes, with diets high in sugar and low in fiber as primary culprit. Constipation can be a painful, straining and bloating condition, defined as fewer than three bowel movements per week. The University of California, San Francisco, notes that constipation can be a symptom of various causes, including a lack of fiber in the diet, certain medications, inactivity, dehydration, pregnancy, aging, intestinal health problems and milk. Because ice cream is made from milk, it stands to reason that milk could also cause constipation. Not all sources agree that milk or dairy other products cause constipation, however. The Dairy Nutrition website from the Dairy Farmers of Canada notes that constipation is not caused by any one food but rather a combination of lifestyle choices, including poor diet and lack of exercise. 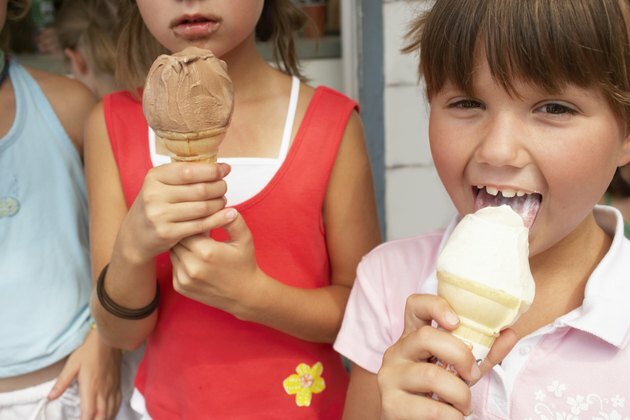 Although there may not be a direct link between ice cream and constipation, ice cream does possess certain characteristics that can lead to constipation. These include a high sugar content and a low fiber content. For this reason, several sources, including UCSF, University of Rochester Medical Center, Palo Alto Medical Foundation and the National Digestive Diseases Information Clearinghouse, all specifically list ice cream as one of the foods to avoid to reduce constipation. According to Dr. Lawrence Wilson of the Center for Development, in attempting to combat constipation, you should minimize processed sugars, such as those in ice cream. Sugary foods can increase the growth of intestinal yeast and negatively affect colon health, which can lead to constipation. The National Institute on Aging notes that you can treat constipation by eating more fiber-rich foods, such as fruits, vegetables, whole grains and dried fruits; getting enough fluids; and staying physically active. If these lifestyle changes are ineffective, talk to your doctor about laxatives. National Institute on Aging: Concerned About Constipation?